Michael Atiyah says he has a proof for the Riemann Hypothesis, one of the most famous unsolved problems in mathematics. A famous problem in mathematics that has remained unsolved for almost 160 years probably still is — despite a new claim by a retired mathematician that he has cracked it. 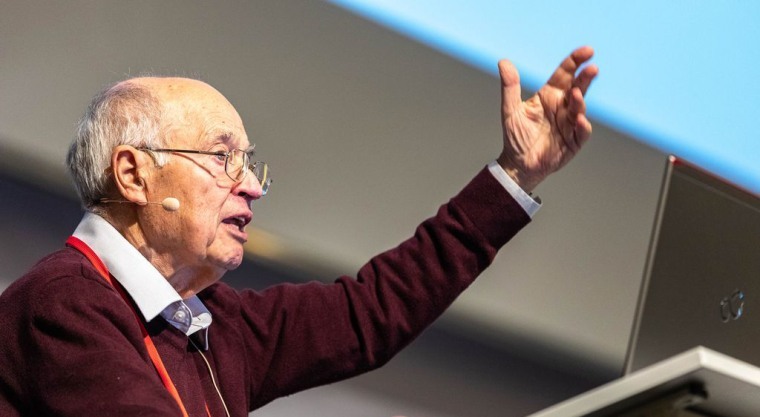 Michael Atiyah, a professor emeritus at the University of Edinburgh in Scotland, announced on Monday at a scientific conference in Heidelberg, Germany, that he had devised a "simple proof" for the Riemann Hypothesis, a problem relating to patterns of prime numbers that has defied efforts to solve it since it was first proposed in 1859. If Atiyah is right about his proof, he could claim a $1 million prize set aside in 2000 for the first person to prove the hypothesis. A proof of Riemann, which would provide a sort of "map" of prime numbers, could also have implications for cryptography and other fields beyond mathematics. But Atiyah's peers are dubious of the claim. "Atiyah is a wizard of a mathematician, but there's a lot of skepticism among mathematicians that his wizardry has been sufficient to crack the Riemann Hypothesis," John Allen Paulos, a professor of mathematics at Temple University in Philadelphia and the author of several popular books on mathematical topics, told NBC News MACH in an email. John Baez, a mathematical physicist at the University of California, Riverside, offered an even blunter assessment. "I know of nobody who believes Atiyah has actually proved the Riemann Hypothesis," he said in an email. "I've looked at his papers on this. His arguments just stack one impressive claim on top of another, without any logical argument." But Atiyah, who has won many prestigious prizes in mathematics over a career spanning more than 60 years, is undeterred. "All radical ideas meet with initial skepticism," he said in an email, adding that he would soon publish an expanded version of the proof that is now available online in an abbreviated form. The Riemann Hypothesis was first proposed by German mathematician Bernhard Riemann in a six-page paper published in 1859. It posits that there is a definite pattern to the distribution of prime numbers like 2, 3, 5, 7, 11, 13 and so on (numbers that can't be expressed as the product of two smaller numbers), which occur less frequently as one moves up the number line. The hypothesis has been checked for the first 10 trillion solutions, but no one has proven that it's true for all prime numbers. Whether or not Atiyah has proved Riemann could take some time to figure out. Even if he delivers the full proof as promised, it will have to undergo years of scrutiny before it's accepted by the Clay Mathematics Institute, the Peterborough, New Hampshire-based foundation that is offering the prize. Mathematical proofs often turn out to be incorrect. In one well-known example, British mathematician Andrew Wiles in 1993 offered a proof of another famous problem, Fermat's Last Theorem, that turned out to contain a mistake. But he was able to correct the error, and he published the corrected version in 1995. "The only unusual thing about [Atiyah's purported proof] is the high-profile way in which he's chosen to share it," Katie Steckles, a mathematician in Manchester, England, said in an email. "Normally this kind of work would be shared with colleagues before a formal public presentation." But Steckles defended Atiyah, calling him a "very well-respected mathematician with a long history of great work. ... While it's great that he's still working on mathematics up to his retirement, it would be a shame if people were harsh in criticism of him at this stage." Want more stories about mathematics?